The oilfield and pipeline industry is just one of the many sub-industries that ensure the oil and gas industry continues to provide a stable product supply to distributors and consumers. Different raw materials are used to keep the operations running, including metals. As the demand continues to grow, production needs to be more precise and efficient. This is where components made of Corrosion Resistant Alloys (CRAs) come into play. Both onshore and offshore extractions involve extreme environmental conditions. Given this, the industry needs materials with exceptional corrosion and heat resistance. Here are four commonly used metals in the oilfield and pipeline industry. Steel is widely used in almost every sector of production in the industry, from harvesting to refining to shipping and distributing products. It is exceptionally strong and has great wear resistance. It is the main metal used for external components and piping. By pairing steel with small amounts of other metal elements, the durability, strength, corrosion resistance and other important traits of steel are further improved. Adding nickel to steel alloys increases its strength and corrosion resistance. Nickel alloys are tough at both extremely high and very low temperatures. When used in heat exchangers, nickel alloys can reduce the heat of oil and gas, providing a safe transfer of the fluid. Nickel is also widely used in the industry since it helps prevent chloride stress corrosion cracking (CSCC) of the components. Copper has great electrical and thermal conductivity and cold-resistant properties. These alloys are also ductile, malleable and non-corrosive, making them more apt for thermal and electrical applications. Copper alloys are commonly used for applications concerning conductivity, abrasion, heavy loads and corrosion (including flex and pump shafts), valve stems, pump impellers and more. Aside from steel, titanium is also of the most versatile and valuable metal used in the oil and gas industry. Adding titanium to steel alloys enhances the density, strength and corrosion resistance of materials. Titanium is extremely resistant to seawater, hydrogen sulfide and carbon dioxide corrosion. It can also maintain its strength even at very low temperatures. 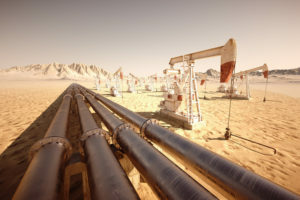 The oilfield and pipeline industry needs high-quality materials including the metals mentioned above to refine and improve their critical operations. Demand for these metals will only continue to grow with the ever-evolving industry. N&S Flame Spray uses only high-quality metals in our production. Contact us for your oilfield and pipeline component needs. Learn more about our products and request a quote!